What do you do get when you take 33 pounds each of eggs, sugar, flour, buttercream, and butter, 44 pounds of modeling chocolate and another 44 of ganache, and a whopping 110 pounds of icing, give them to one British amateur baker, and wait for 250 hours? A very impressive feat of dessert engineering that will haunt you through all your many days. Baker Laura Mason has chosen to celebrate the impending nuptials of Prince Harry and Meghan Markle with big ol’ life-size cake replica. The cake is modeled off of the couple’s engagement photos, taken in November 2017. According to Business Insider, Mason’s creation was sponsored by Cake International, a cake competition that will celebrate its 25th anniversary when its show opens its doors in November. 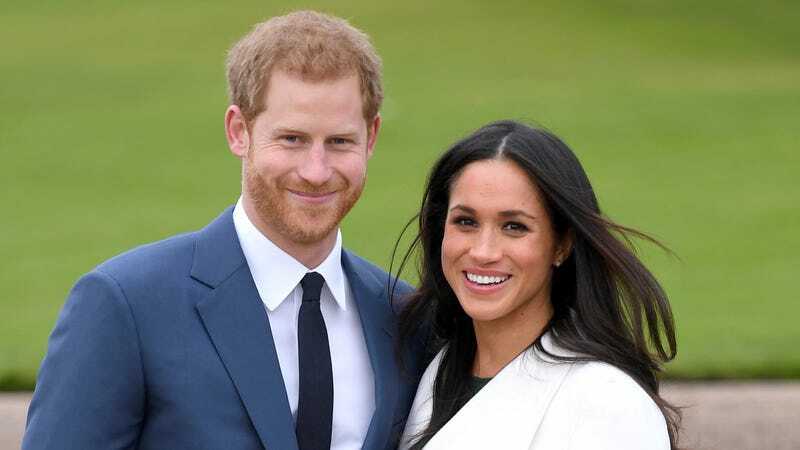 Cake Harry and Cake Meghan will be on display at the show in November—“The cake is wrapped in sugar paste so is airtight,” Mason told BI—and won’t be eaten by anyone, which is both kind of a bummer and a blessed relief. Wait wait, you’ve got to see a) the cake next to a person, and b) the nightmarish before photos. It took Mason 250 hours over the course of six weeks to make the cake, though Business Insider doesn’t note how many of those hours were spent trying to avoid locking eyes with Cake Harry, who looks like he could steal your soul out of your body, and not in a romantic way. Mason’s sponsor footed the bill, but had they not, this very impressive piece of nightmare fuel would have set her back $4,000. Hey, it could have been worse: According to BI, Mason had to take a second pass at Harry’s face when a heatwave in the United Kingdom caused his face to melt. We at The Takeout are generally opposed to cake-people, but have to admit that we’d much rather see this version than a version where one of those soulless eyes is dripping down a buttercream cheekbone.